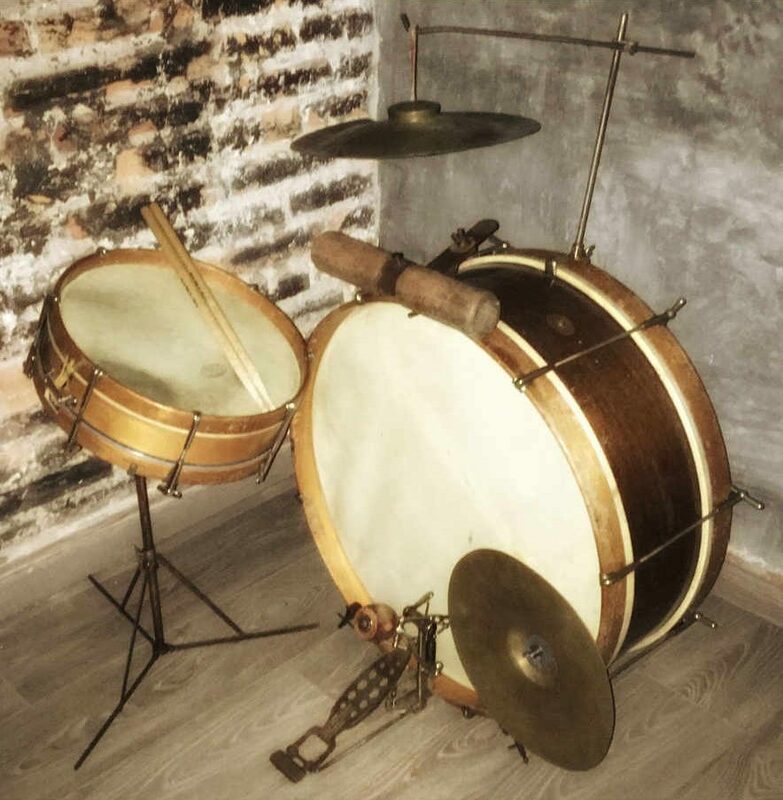 Happy 100th Birthday To… The Modern Drum Kit! Did you know that 2018 marks the 100th birthday of the drum kit as we know it today? Back in 1918, Ludwig released the Jazz Er Up. This was an “all-in-one” drum set featuring a single-tension 3″ x 12″ snare drum, and a single-tension 8″ x 24″ bass drum. In the photo below, you’ll notice the snare and bass drum heads are tensioned on the resonant side, which also pulls on the batter side at the same time! Also included were two cymbals, one 13″ Chinese crash (hanging from the bass drum) and one 12″ crash (mounted to the bass drum’s hoop). The lower hoop-mounted cymbal was hit with the bass drum pedal’s cymbal striker. The Jazz Er Up also featured a wood block mounted to the top of the bass drum’s hoop. This kit provided a huge range of sounds to drummers at the time, and sparked the beginning of the drum kit as we know it today. While drums have been played for thousands of years, there has been a huge ongoing evolution in the relatively short time since the Jazz Er Up was released in 1918. If you’ve got a spare five minutes, NPR has a great little audio special covering the last 100 years of drums and drum kits. Drummer and historian Daniel Glass is interviewed, along with Fugazi’s Brendan Canty – it’s a great little piece well worth listening to. Listeners are taken on a journey starting at Ludwig’s Jazz Er Up, later innovations, the invention of electronic drums, right up to today’s drum sets. Check it out below, or head to NPR’s website to listen or read the transcript. Next PostNext Sabian’s Custom Cymbal Shop: Create Your Own Custom Cymbals!